and what a journey it was. 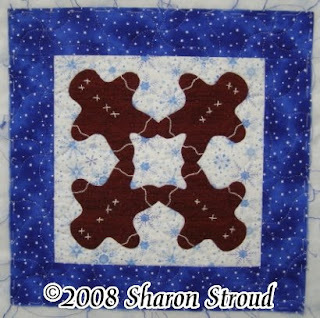 This appliqued and embroidered top had been done and basted for several years when it cried out to be hand quilted just after Thanksgiving. I marked it with the Clover Fine Line Marker (the one that irons away) and quilted it in a couple days. I decided to take it to a class to show them how easily the marks iron away. (And they do; that is not the horror story coming.) While pressing, the shop iron "leaked" majorly onto my almost-finished quilt. I didn't think much about it, since I had washed all the fabrics before I used them. Since the iron was leaking, I only removed the marks from part of one border and stopped. I showed the class that the marks were gone and then went about helping students. I scrunched the quilt up against me while showing someone something else and then threw it back into my bag. Like everyone else, I have to do laundry. I washed a load of my clothes and then set the shirts aside to be ironed later. When I got to the ironing, the shirt I had worn that night had a big pinkish stain on the button flap--and it was pretty noticeable since the shirt is white, yellow and blue striped. At first I was nonplussed (love that word!) --where could it have come from? So I put some Tide to Go on it, rewashed it and it was gone. So far, so good. Unfortunately, things took a big downturn after that. When I pulled the quilt out of the bag, YIKES!!!! The red fabric on one arm had run onto that pristine white background and through all three layers to the backing, and it had stained the embroidery on that arm. I needed major amounts of chocolate to even keep from fainting. By now I was desperate. After attending the preview party for Quilters Corner's new building (absolutely fantabulous! ), I bought Synthrapol and Retayne. After girding my loins for a couple days, I threw caution to the wind and poured Synthrapol into a dishpan, added the hottest water I could stand to get my hands in and...pushed the quilt under. The worst that would happen is the quilt would be ruined for my use, but I figured Callie could use it to sleep on. The directions say to agitate the quilt for about 5 minutes. So I pulled the quilt out of the water and pushed it back in, pulled it out, pushed it in. At first nothing happened. Then...whoosh...a giant wave of color fell off the quilt and into the water--it actually turned the water pink! So my worst nightmare was that all the white parts would be turned pink by this. But my five minutes were not up yet, so I kept agitating. BEEP! Time's up. I take the quilt out, dump the water and start to refill the pan. Then I rinsed and rinsed the piece. At long last I laid the piece on a towel, blotted the excess water and left it to dry. I had learned the hard way that to closely scrutinize the quilt for pink while still wet was a fool's errand. So I left it for several hours, turning it occasionally to let it dry better. And (drum roll please), every bit of the dye came out. The picture above and the detail below are after this odyssey was over. It still needs a sleeve, binding and a label, but it survived multiple washings and treatment that no normal quilt should ever be subjected to. The cause of the bleeding? As near as I can figure, it was the difference in the water. I had washed the fabric at my house (no chlorine, but lots of minerals) and had pressed it at the shop with water that was different and may have caused the dyes to become unstable. What I learned from this process? Only press where I know the water!!!!! This took years off my life and made my hair even grayer. For those of you who saw me during these traumatic weeks, that's the explanation for that manic look. As always, truth is stranger than fiction. I couldn't have made up this story if I'd tried! Stay warm, keep quilting, be kinder than necessary to everyone--including yourself. I feel like I am in a blog-fessional--forgive me, readers, for it has been 10 days since my last post! I've been busy in that time--lots of quilting--designed a new project and have the top completed (can't show it just yet), have hand sewn binding and sleeves to three quilts, have been hand quilting another piece, finished the first Sleepwalker sock and have the second one cast on and a bit of the cuff done. There were other things done in that time, but nobody wants to hear about vacuuming, dishes, snowblowing, yada yada yada. The biting cold, snow and blasting winds have played havoc on classes--I was beginning to think I'd never teach again! But the spell has been broken and there are six classes lined up for this week. Keep your fingers crossed that the roads are clear and the winds calm. At 22 degrees today, it felt like a tropical heat wave! A short post, to be sure, but it catches you up and let's you know I'm alive and quilting. I should have some pictures for next time. Til then, happy quilting...and still try to stay warm! After the holidays, the days just seem out of synch. I always think it's a different day than it really is, which can be dangerous! One of my favorite quotes is "Warning, dates on the calendar are closer than they appear!" 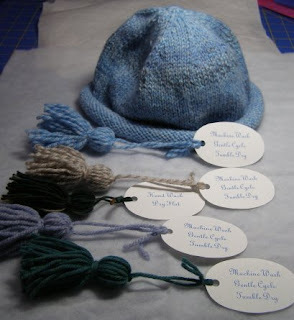 As you know, I made several knitted items as gifts this year and I have made several chemo hats to be given away as well. In racking my brain for the best way to let the recipients know how best to care for their knitted item, I came up with this idea. 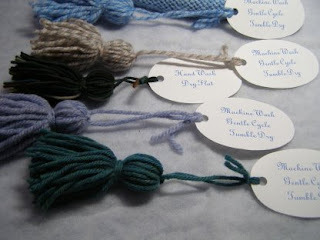 I made tassels from the left-over yarn and attached an oval made from cardstock that includes the care instructions. These "care tags" can be hung in the laundry area as a reminder! I'm sure there are little fabric tags that can be sewn inside the items, but I hate them! They are usually the very first thing to be removed and tossed--or, if I keep them, they get lost. I'm pretty proud of my plan--I don't know how it will work in reality--but I did my part. This blue hat was a gift to a friend. We celebrated with lunch at a family restaurant. When she put the hat on, a little girl at another table piped up and told her how cute the hat looked on her! That made everyone's day! 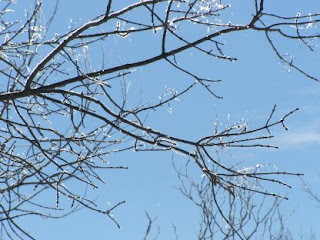 We are having ice storms and high winds here. And the snowplow hit my mailbox again. The third time in less than two years! Needless to say, I am not amused. They even broke the pole holding my American flag on top of the post. There is absolutely no way they can say they cannot see the mailbox and it has been in the same place for over 30 years! It makes me want to put up an old rusty pipe with a beat-up metal box--those they never seem to hit. Okay, enough ranting--but really!!!!! Here's a picture of the ash tree outside my sewing room window. The sun hit the snow/ice on the tips and made them shine. Many thanks to all of you who have been commenting on the blogs. And for the many kind words. They are greatly appreciated. If you want a really good laugh, check out the Yarn Harlot blog--they were installing a new washer and the stories (days' worth) are too funny. You, too, will mourn the passing of Sir Washie. Til next time, stay warm and safe and send good vibes out into the world. It seems like it is harder and harder to find larger blocks of time to accomplish anything--even quilting. But today I spent almost all day in my sewing rooms and did the machine part of binding and sleeves on five (yes, 5) wallhangings. I am very excited! The hand part I can do in found bits of time, but it takes so long to find the right color threads, wind bobbins, blah, blah, blah when doing the machine part. I have also designed a new project--more info on that as it becomes available. 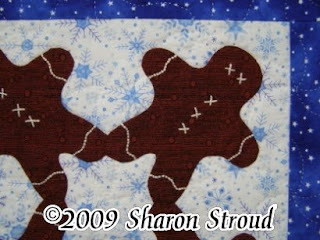 It will combine hand piecing and hand applique--and I will, of course, hand quilt mine! I will really be "speaking to the hand"! LOL several times on that one--I know you want to. Okay, so many of you are groaning--what can I say! There should be photos in the next post. But I could feel the rumblings of "when is she going to post again?" and I am trying to forestall that. Be kinder than necessary, for everyone is fighting some kind of battle. It costs nothing to smile and to say a kind word. I am going to try really hard to be a blessing to others this year--will you join me? 2009...remember when everyone was worried about Y2K? How can it be nine years later already? I did finish my knitting before the new year struck--actually with over 24 hours to spare! I finished the hat and the wrist warmers. And I am proud to say that I only have two projects still on needles--a pair of patterned socks and a lace scarf. And, although I did make a dent in finishing my quilting projects, I think trying to finish more than 120 on the list plus keep abreast of class projects and all that good stuff was just not going to happen. But I did finish quilting several pieces and have four to bind. I hand sewed binding on three other pieces. I do have a large number to do labels for--I need an entire day (probably a very conservative estimate) to get those made and attached.